Yesterday I was in London for W-tech, the UK’s biggest ever event for women in technology. It was fantastic. The day had a mix of panel sessions, networking opportunities, displays, demos, recruiters, and of course talks. I was running around most of the day as I chaired 2 sessions, gave a talk in another, and even managed a quick G&T with the parents… But I still managed to soak up a lot of the atmosphere and chat to people from BCSWomen and all over. I was really pleased with my talk – I’m used to talking to academics and it was hard to pitch it to a general audience (who were probably a bit techy, but almost certainly not in my field). I got the feeling it was about right though, so maybe I am getting better at this speaking business. And I only stuttered once or twice. 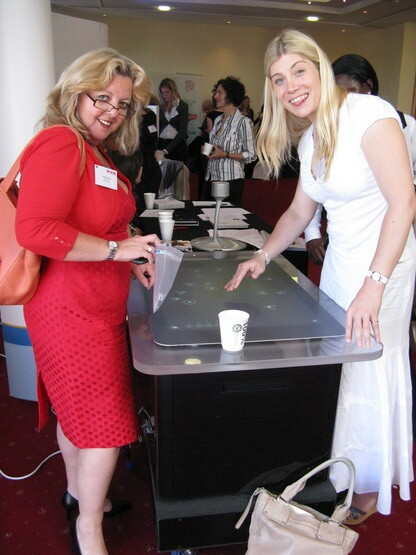 Eileen Brown and Kate Craig-Wood playing with a Microsoft Surface device. These women gave great talks – I know, as I had the very easy job of chairing them both! 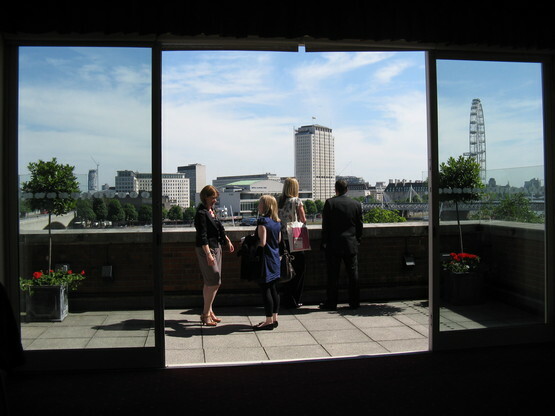 The view from the Riverside room of the IET. Rather nice, innit? 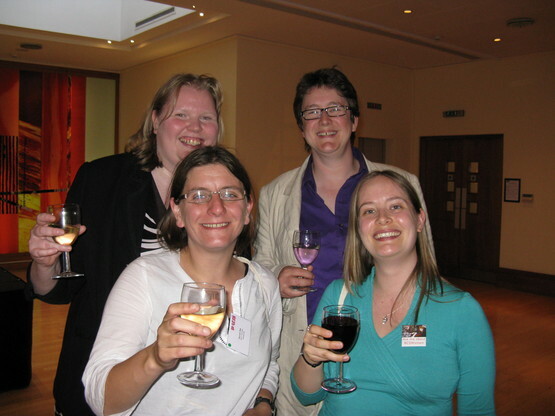 Some of the BCSWomen Committee members at the reception in the evening. Arranged by height. I’m the shortarse front-left, the other vertically challenged member is Anne Workman from IBM. The two giants are Karen Petrie, soon to be a lecturer at Dundee uni (our chair), and Sarah Winmill, from the V&A. Lots of the committee were there at some point or another, but we didn’t ever manage to be in the same place! Oh wow! These pictures are great and make me wish I’d been able to come along. Hannah, just to say I found your talk excellent, and even remembered to look out for the observation cameras in tescos yesterday (but our branch doesn’t have them!). 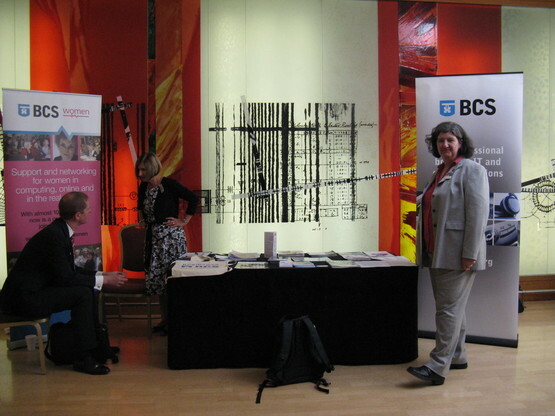 And the event was excellent – shame I missed out on visiting the BCS Women stand (being a member). Well done, and heres to a successful event.